It was good to play with my brothers in the backyard and we were lucky with our coaches as well. Greg had a coach called Lynn Fuller. By the time I had come along, we built a wicket in our own backyard and Lynn said, "The soil is over there on the local ground". So we used to get a boot load of that in dad's car every day and spread it out on the backyard and it became a very good wicket over a number of years. We would go to Lynn's place pretty much every Sunday, 12 months a year, unless it happened to be wet. I figured the cover region was the area where the ball went more often than not, so I thought it was a good spot to field. It keeps you occupied and always in the game. I considered myself more as a batsman, but initially I played for Australia in one-day cricket mainly as a bowler and a fielder. I was batting at No. 7 or 8 and occasionally I batted up the order. In the Associate nations, never at any stage have I had the whole squad together other than in a tournament. You have to do things over and over again, because instead of getting everybody together to do it once, you have to do it with this guy one day and half the time somebody will end up missing out. I think from what I read about Vic [Richardson], our grandfather, and know about Ian's captaincy, they had a very similar attitude to the captaincy: try to be as aggressive as possible. Try and get somebody out somehow. They both looked after their players very well. I had no hesitation in signing for World Series Cricket. Western Australia had six players involved before I joined them and a few of them were retired players. Robbie Langer, Bruce Laird, Rod Marsh, Mick Malone, Dennis Lillee were all current players, and the first team was picked for WA for the 1977-78 season and I wasn't in that. Lillee said to me, "Bad luck about not making it in the WA team. Don't worry, something better might come along." I had no idea what he meant. And a few days later Robinson, Dennis' manager, rang and said, "Do you want to join World Series Cricket" and I said, "Yeah, where do I sign?" In Australia or South Africa, you'll be able to throw yourself around the field, and by playing Australian Rules football or rugby union or soccer, they are tackling and learning to slide, which is very important in the game these days. It probably mostly revolves around the better fields from a younger age. Coaching the school development age groups - 16 to 18 - is what I like the best. The Bangladesh side, apart from three or four blokes who were late 20s or early 30s, had a lot of 18- to 21-year-olds. Singapore I look upon as development as well. It wasn't so much with the Sri Lankans. I'd rather work with 15- to 16- to 22-year-olds, particularly on fielding and running between wickets. Eddie Barlow was the captain of the Cavaliers. He did a very good job, it wasn't easy captaining a side with a mixture of Australians, English, Indians, Pakistanis - occasionally there were some West Indians, but they didn't give us any good fast bowlers! We had a whole mixture and nobody probably really wanted to be there. They would rather be in the main games. We had some surprising results. We won a few games we probably weren't expected to. I remember before Ian went to England in 1968 with his Ashes tour, there was a school near where he was living which had glazed concrete, really shiny concrete. 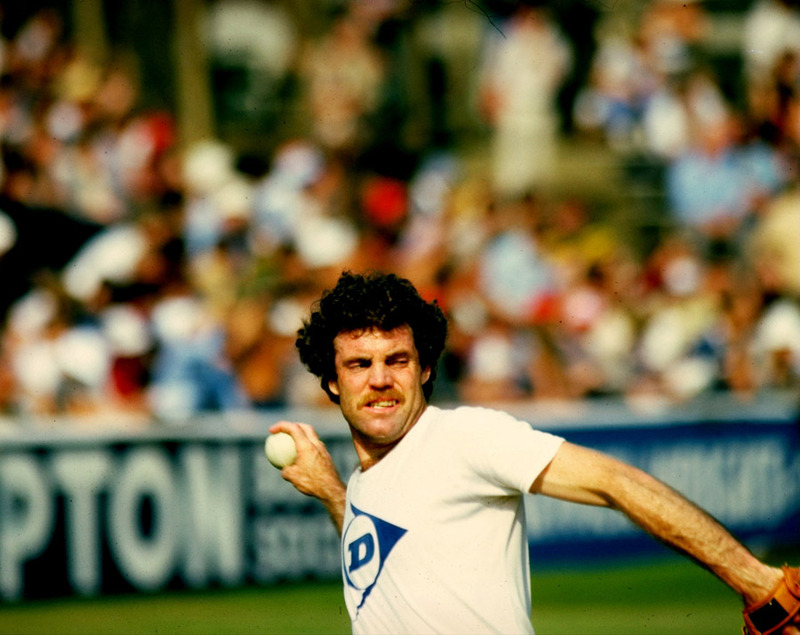 England at that time had John Snow, a very fine fast bowler. Greg and I, with Dad, would throw brand new baseballs at Ian, because they would skid on and bounce up. The concrete that's not glazed rips the balls apart and stops them. When it's shiny it skids on like on a mirror. You have to specifically work out and say, "This is what I want to achieve today", and if you achieve it in ten minutes then you have achieved what you wanted to do. If it doesn't quite come so easily just try and limit it to a normal amount of training rather than trying five or six hours a day. The players of my era wouldn't have enjoyed that. I'm sure the players of the modern era probably don't enjoy it either if they are forced to try. You want to have a rest physically and a bit mentally and stay as sharp as you can. From 1975-77, I played league cricket in England in the Australian off season - in the Central Lancashire League and the Lancashire League. I was doing very well over there. When I first played for South Australia, I did all right. Then I got injured right at the start of the second season - I broke my nose and cheekbone in a fielding accident. I damaged my shoulder as well. I couldn't throw very well. Fielding has always been one of my main skills, and I lost confidence in the fielding. I wasn't getting any runs, I wasn't bowling much in those days, and I wasn't fielding terribly well either. I ended up playing all of the first-class season and had a bad season. I still couldn't get runs in South Australia the following season but I'd go to England and get runs. I got dropped from the South Australian team. "When I first got picked for South Australia, Ian said, 'You got to decide what sort of a player you want to be - an attacking player, or more grafting.' I'm not really a free hitter of the ball, so the choice I made was, I was going to be more of a grafter"
Eddie once said to me early on in the series, "You gotta stop trying to play like Ian or Greg and play like you. Just be Trevor." That definitely helped me through World Series. It was great to play at the Adelaide Oval, which I had grown up watching. I didn't watch my grandfather play there but I watched my brothers play there and a lot of other people. You are not going to prove too much in three Tests, but if you look through the list of Australian players there are a lot that have played between one and ten. Three seems to be a fairly common number. Being on a tour that is not very successful probably damns your chances to get another go. Vic was in the Bodyline series in 1932. 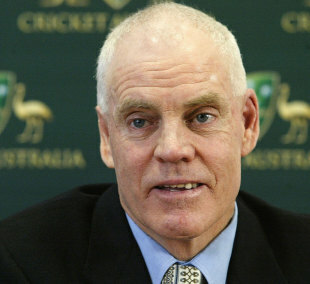 He reckoned that if Australia had good enough fast bowlers, they could have retaliated, and because - I'm not sure how many - the English players were professional, their livelihood depended on cricket. They couldn't afford to get hit and not be able to play cricket. He was fairly sure the professional players in the England side would have convinced [Douglas] Jardine to stop bowling Bodyline. Greg did not have a lot of weaknesses as a batsman. I got him out once that I can remember. He tried to hit me over mid-on, because he probably got sick of facing me and must have thought: "It's about time you went over mid-on", but he didn't quite make it. This was NSW v Queensland in Brisbane in the early '80s. Ian was considered a better captain and he is generally considered one of the better post-war Australian captains there have been. He was a very good player as well. Terry Jenner always said that if he was facing the death squad and he had to choose a batsman to save his life, he would pick Ian. In baseball you learnt to slide before other cricketers were sliding very much. I have spoken to Brian McKechnie [the New Zealand batsman who faced the underarm delivery] about it, because we have been involved in a number of functions, like the fifth anniversary, tenth anniversary etc. So I got to know him quite well. I didn't know him the day that I bowled underarm to him. Some years later we played in a double-wicket competition for the same team. We got on well over the years. The functions seem to have died out a bit. Malaysia gets a lot of support from the government, whereas in Singapore cricket is not looked after because it doesn't generate money, and Singapore looks at what generates money. I think there was a sort of a negative attitude to fielding in the subcontinent and perhaps it was to do with the grounds that would come up in their youth and they'd think, "I'm not fielding out here, it's dangerous." The technology and video analysis all have changed dramatically. I'm not 100% sure that it's all of benefit, a bit like the DRS sort of technology. In the 1972 Ashes in England, just before the Oval Test, Australia were playing Northampton, I think, and mum and dad were in England. I was in England also playing a bit and watching the Ashes. Ian just played some shots and got out, came around to see them and dad said, "Nice shot, son." I can't tell you what Ian said to him but it basically meant "Shut up." In the next Test, Ian and Greg both got hundreds. When Ian came, mum said, "Congratulations son, you were right." I'm happy that I played, but obviously would have loved to play a lot more. Greg played 87-88 Tests, Ian played 74-75. So 40 or 50, or something like that would have been better. I played the longest with NSW, and in terms of success I had probably more there. I had some initial success in Adelaide and then the other period of time that I played there, I wasn't very successful. For WA I played only four games, in which I got three fifties. I went to South Africa with a Derrick Robins XI. Robins was an English bloke who ran private tours to South Africa when they were out of international cricket. He was still able to go there and play without any bans or that sort of thing at that stage in 1975-76. I went there and did all right. When I first got picked for South Australia, Ian said, "You got to decide what sort of a player you want to be - whether you want to be an aggressive, attacking player, or more like a grafting sort of player." I had to think about that and that I'm not really a free hitter of the ball, so the choice I made was, I was going to be more of a grafter. I preferred to open the batting or bat in the top order somewhere. But I probably wasn't good enough to bat at No. 3 or No. 4, which is why I was where I was - down at the bottom. It just depended if we had couple of good openers, so I wasn't going to get a go there and at No. 3 or No. 4, or even at 5 or 6, so 7 is where I got a go in the international side. The fact that I got to play for Australia was terrific, so I was pretty prepared to do whatever I had to do. Ian probably was able to retaliate with Lillee and [Jeff] Thomson against England in 1974-75. England came to Australia expecting to bounce Australia. Stupidly they did not bring John Snow. Tony Greig ended up bowling some of the bouncers, because the England fast bowlers wouldn't bowl them. He made a hundred in the first innings in Brisbane, slashed a lot over the slips for four. After South Africa I went back to Adelaide and played some club cricket. I had spoken to the Scarborough Cricket Club in Perth about shifting there the next summer, in 1976-77. I played the last four Sheffield Shield games for Western Australia. What I found with the Singapore team is that you've got to compromise on some of your standards because these guys are all amateur. Greig wore sandshoes to bat and Thommo invented the Sandshoe Crusher, just trying to hit him straight on the feet. Greig was about 6ft 7in and found it difficult to get down to yorkers. During WSC, Michael Holding got him bowled bowling yorkers quite a lot. It went to the extent that I saw Tony practising one day against a bowling machine, facing yorkers, and he just kept getting bowled by the machine, which everybody thought was quite funny. Most of the players were signed for WSC up at the Centenary Test in March 1977. I knew nothing about it at that stage. Living in Perth, it wasn't easy to stay in touch with family, Greg was up in Brisbane, Ian was playing club cricket in Victoria. When I was around 17-18, finishing school and about to get into adult cricket full time, Greg was playing for South Australia and Ian was playing for Australia. Other kids in school would say, "I guess after finishing school you're going to play for South Australia and then for Australia." You learn a lot of skills playing other sports, even if you are a cricketer. Summer time we played cricket, winter time we played baseball. Generally, I don't mess around with technique too much unless when I coach kids. I'm not a big fan of Hawk-Eye. It's only the same guess as the umpire's. And you've got an operator of that machine and you don't know what influence he's having on the machine or what back-end he might be getting to say if it hits or misses. Hopefully they've got all that covered. With Snicko, sometimes it might show sometimes it might not. People probably wouldn't remember me [if the underarm incident hadn't happened]. I think there are a lot of players who have had a lot more [than what I achieved] and they don't get remembered. Maybe the fact that three of us played... but I wouldn't think much at all. I don't try to teach batting and bowling technique a lot. It's more just ideas of what you should be trying to do as a batsman, what you can do with your skills, rather than trying to change your grip and your stance. Against spinners I might try and get you to use your feet - getting forward or back more. It was a bit more difficult to slide near the boundary when there was a fence rather than a rope. I can remember sliding to stop things with feet first but it didn't work all that often, because you have one eye on the fence and the other on the ball. It was an advantage playing in the backyard with Ian and Greg, although that didn't happen as much, because there is a nine-year gap between Ian and me. So when I was 11, he was 20, married and gone from home. It was more Ian and Greg and then Greg and I, rather than all three of us together. Not that we three didn't get together at different times. When I was in Bangladesh they were just in the process of starting to build grounds. The Bangabandhu Stadium, during the winter time, had soccer. The sideline ran virtually right alongside the square. So the referee was basically running up and down one of the wickets. In Australia there has always been high priority on fielding. You go back to the 1960s, '70s, and until the '90s there'd be odd guys who weren't great because they were slow or unfit, whatever the case. But you can't afford to not be a good fielder now.